which got us talking about Super Mario Brothers. 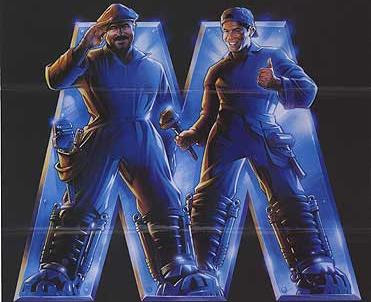 Did you know there was a Super Mario Brothers movie? I didn't. Thankfully we know of the wonders of You tube, and were able to watch it last night. I LOVED it! It is so silly and has so many plot holes, and just had me laughing through the whole thing. What a silly show. It is perfect for ten year old boys. They would eat it up. I guess that just shows I have a humor level of a ten year old boy, but what can you do? I love sitting with my hubby and laughing at something so ridiculous that you can't help loving it, and having my hubby watching me, laughing at my amusement. What a perfect evening it would have been (had I been able to get rid of that monstrous headache). I think next saterday will be fine are we still planing on 5pm... 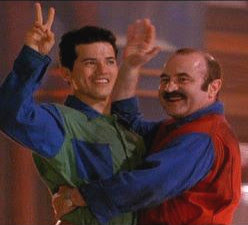 I love 90's movies they make me laugh..
Ha ha, my husband is a nerd too. His dad is really a trekkie, but I'm super glad that he is not!